Here’s a real turn-up for the books. Wilhelm Schüchter (1911-74) is hardly remembered these days and I suppose such reputation as he possesses is as a journeyman. This despite a number of important positions: Berlin Staatsoper in 1942-43, a decade alongside Schmidt-Isserstedt, between 1947 and 1958, at the North West German Radio Orchestra; and Dortmund (1962-74). It’s perhaps telling that in the only English language section of the booklet for this disc, which is a profile of the NHK Symphony, Schüchter’s name isn’t mentioned. 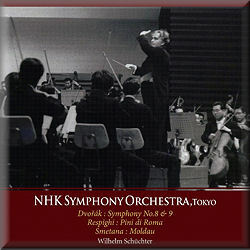 This is regrettable, as Schüchter was chief conductor of the NHK from 1958-61. The booklet wants to concentrate on starry guest conducting names; Ansermet, Karajan, von Matacic, and Leitner. I’ve listened to the last two directing the NHK and they achieved none of Schüchter’s tonal lustre and individuality, as represented in this rather remarkable example of his art devoted largely to Dvorák. Standards were variable with this orchestra in its earlier years but on Schüchter’s watch things seem to have been secure. He was clearly a trainer of skill. He made a number of LPs, including Dvorák’s New World, which I’ve never heard. With the NHK he also recorded Mayuzumi’s Nirvana Symphony for the Mainstream label, so at least some evidence of their time together was captured in studio conditions. He directs a New World to excite and stimulate. He pays great care to balance the winds, and ensures the percussion is vividly audible. Fortunately this is a stereo recording, and quite a good one, so one can appreciate the brassy flair and authority (very occasional overbalancing apart), and the energised strings. The slow movement is tauter than Reiner’s, less taut than Ancerl’s live 1956 recording with the Czech Philharmonic; and there is some especially warm and yearning string tone. The scherzo is well sprung, at a fine tempo — all his tempi here seem natural, largely due to his superior rhythmic sense and use of rubati — and the finale is grippingly powerful, and full of character and verve. There’s an excellent peroration. All round this is a notable addition to the New World’s discography. Only slightly less impressive is the Eighth. This is in mono. Again the playing is really excellent and thoroughly committed, revealing some idiomatic touches. For my taste Schüchter is just a fraction too relaxed in the opening movement but there’s grandeur and sensitive string moulding wherever you care to listen. Anxiety and tension mark the start of the Adagio; then sunshine breaking through. Maybe, again, he is rhythmically a notch beneath Czech contemporaries in the scherzo, but at least his vision is consistent and well argued. That said, there is some luminous string phrasing here, and at one point I repeated one gorgeously played passage many times just to savour it. With a strongly etched finale, this is another excellent performance. The remainder of this twofer offers Respighi’s Pines of Rome in an evocative recording with fine wind interplay and a triumphal final March that generates plenty of excitement. Vltava is heard in a cannily shaped performance that, whilst not as galvanic as those by Talich, Ancerl, Kubelík and Jeremiáš, is still thoroughly convincing. The Slavonic Dance in E minor makes a charming envoi. Without doubt these are the best played NHK performances I’ve come across thus far in King International’s historic trawl through the orchestra’s archive. In many ways they’re also the best conducted. This twofer also serves as a salutary reminder that honest, hard-working musicianship, training ability, and interpretative insight can bring rich rewards. Schüchter a journeyman? On this evidence, absolutely not.